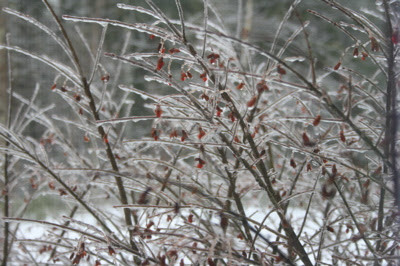 Look at the ice on the branches, beautiful isn't it?! Today, once again, school is closed. This time not because of snow storm but because of freezing rain. The temperature is not too cold. It's about 30 degree F (3 degree C). The kids were having a blast playing outside. Thia was having hard time walking in the deep snow. 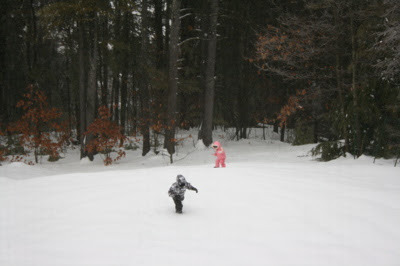 Benny was jumping around like crazy on the snow. I don't like being trapped in the house for many times. Like two days ago, the temperature dropped to 12 degree F (-10 degree C) plus windy. Soooo ... coooold!!! I have been complaining too much about the weather here or even in Indonesia. When I was in Indonesia, I complained a lot about how hot the weather was. I complain just about everything actually. Not good! Anyway, usually during the freezing rain, the road will be slippery. I am hoping the temperature tonight will be warmer, so the ice will melt and be gone. Otherwise, my driveway will be icy and wicked slippery. Once, two years ago, I didn't have enough experience driving on the icy driveway. FYI, my driveway is a little bit steep. I was going down the driveway and I couldn't stop my car. I was scared to death! 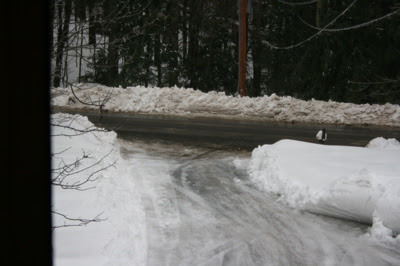 Fortunately, there was no car passing by and I didn't drive into the woods in front of our house :( .